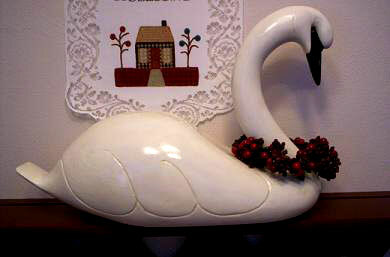 Holiday Berry Swan is part of the Holiday Swans Collection. Here in our mitten state, swans have proven to be a popular and much loved accessory. With sleek body lines and facial details (black glass eyes) this exquisite water fowl is a beautiful addition for any home, business, or vacation retreat. Each piece is hand made and made to last. They are meant to portray simplicity and beauty. The neck decorations are only limited to one's imagination.